Pine Ave e Northshore Drive casa de praia adorável. Anna Maria Island casa de praia de férias localizado no extremo norte da vila histórica de Anna Maria, Anna Maria Island. Apenas a alguns passos Pine Ave, a praia, restaurantes e lojas. Ande convenientemente em todos os lugares. Nós temos uma outra de 2 quartos 1 banheiro villa para oferecer, bem como, visite VRBO listagem # 394722 para obter informações. Todas as manhãs, com ambos a nossa localização villas você pode desfrutar de um curto passeio a comer bolos maravilhosamente frescos cozidos, pães e café torrado na loja de antiguidades e padaria local apenas fora da Magnolia e Gulf Drive. Passeie pela Pine Ave. e voltar no tempo com fachadas típicas e cafés e varandas, todos com cadeiras de balanço. Experimentar alguns dos melhores lojas costeira ao redor. Junto Pine Ave., Spring Ave, ou Magnolia você tem acesso rápido para o lado oeste da ilha exibindo 7 milhas de uma praia de areia branca ou para o leste, a uma curta caminhada para o lado da baía da ilha e passar o tempo na histórico da cidade cais durante a pesca, ou ver a ponte Skyway. Embora baixo em Pine você também pode experimentar o centro da cidade pitoresca de sorvete, restaurantes, teatros e lojas. Para os entusiastas do desporto ao ar livre há pesca, passeios de barco canoagem, parapente, passeios ecológicos, ciclismo, aluguel de segway, surf, jet skis, NEV e aluguel de carrinho de golfe, golfe e muito mais. Jeff e eu viveram e trabalharam aqui na Anna Maria Island por mais de 20 anos agora e gostaria de compartilhar nosso pequeno pedaço do paraíso com você. Nós fornecemos algumas cadeiras de praia, um guarda-sol e praia vagão para sua conveniência. Há uma empresa de aluguer abaixo da estrada que vai alugar mais itens, se necessários, tais como bicicletas, carrinhos de golfe, cadeiras, cadeiras, etc. This house is in a great location - we were able to walk to most restaurants and shops and a very short walk to the beach. House is very clean and had everything we could need for our stay. We could tell the owner is very focused on the details and ensuring a pleasant stay. We are so happy you enjoyed your stay with us. Please come again . Adorable and convenient to everything! This little bungalow was such a gem! Michelle provided everything you need to stay and have an amazing stay on AMI. There were fresh linens in the closet for all of us, including beach towels! She also provided a beach wagon with tons of toys and shovels for the kids to have a fantastic day on the amazing beaches. The kitchen was completely stocked with every amenitiy; down to the salt and pepper. We didn’t have the opportunity to use the outdoor grill but there were even BBQ utensils available for our convenience. Overall, just a fantastic stay! We would absolutely come again and will certainly ask to stay in Michelle’s adorable home! Our family of five stayed in this house the week of July 21st. The location was absolutely perfect. We could walk to many restaurants, shops and it was a VERY short walk to the beach. We didn't feel like we had to pack everything we needed for the day because it was very convenient to go back and forth. Although this is simple, providing beach towels was something that has never been provided before in any house I have rented. The fewer things that we need to travel with and bring from home, the more convenient. The property was very clean. We cooked several nights during our stay and this house had everything we needed. The owner was so wonderful to work with throughout the booking process and even checked in with us to make sure we didn't need anything during the week. So glad you enjoyed your stay. Come stay with us again. This was our third stay at the Northshore Beach House, and we've been very happy each year. Both units are great, with the rear unit offering even more privacy and space. 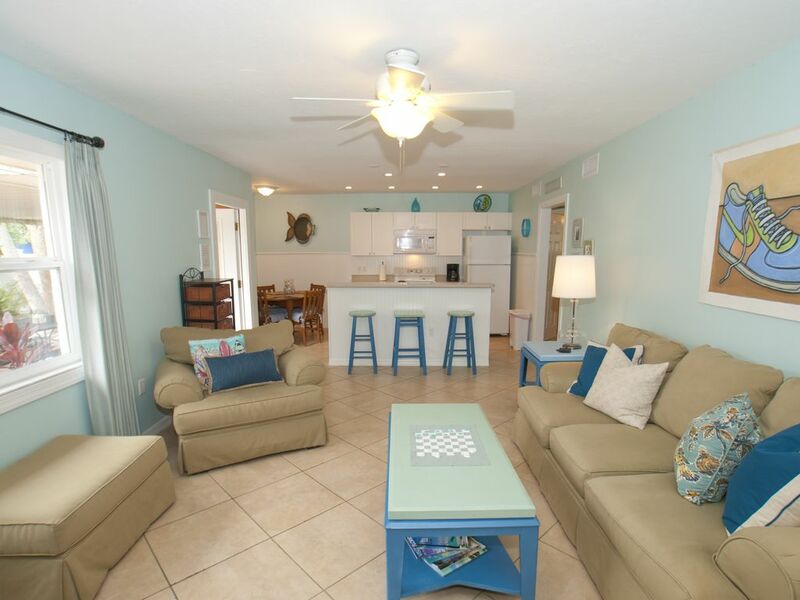 Location is perfect, just a block from Gulf Drive, and in the heart of Anna Maria- coffee shop and freshly made donuts around the corner, and the beach entrance is right next to the Sandbar, a great local restaurant right on the beach! Looking forward to another great stay this Summer. We are so glad you enjoyed your stay with us and looking forward to your stay with us again. See you soon!!! NorthShore Beach House is the Best! Another fantastic stay at North Shore Beach house! I cannot say enough wonderful things about this rental. The owners, Michelle and Jeff are absolutely fantastic to work with and are available should you need anything during your stay. The location is perfect - just steps to historic Pine Avenue. The owners provide everything you need for fun beach days - beach cart and towels, chairs, toys, etc. The kitchen is well stocked for those evenings when you want to BBQ and relax on the patio. The Monkey Bus is available for pick up and drop off anywhere on the island (and off) - just call Doug for details! A trip to Starfish Company, Tide Tables or Swordfish Grill for lunch or dinner in Cortez will not disappoint! Fresh seafood and laid back atmosphere. I am already looking forward to booking my next stay at North Shore Beach House on AMI! This was our third time staying in this home. I can't say enough about it!! I 100% recommend this home. It is close to everything. Takes minutes to walk to the beach, shops, restaurants yet it is private and quiet. You can't beat the location. Our friends rent other houses on the island and they all agree that we have found the gem, the best one! The house is immaculate and tastefully decorated. I love the kitchen because we cook a lot. It has everything I need! I love the outdoor seating and grill. The beds are very comfortable, too. There is an private outdoor shower that my kids LOVE (not shown in pics). We have already booked this property again for our forth time. I don't even bother looking around because I can't think of anything else I would want more than this home has to offer. We always love having you back every year! Thank you for your loyalty and caring words. We love sharing our little slice of paradise with you . A praia eo pôr do sol é uma obrigação cotidiana e todas as noites. O jantar em Anna Maria Island varia de muito casual para um dos restaurantes melhor avaliado na costa oeste da Flórida, o Beach Bistro. A ilha também oferece uma maravilhosa Ilha Trolley livre que os nossos hóspedes podem pegar à direita da rua. Os anfitriões câmara local pode festivais de Bay Fest, Wine on Pine, Festival de casamento, arte fesitvals, música e comida fesitvals e muito mais. Além disso, há um monte de outras coisas para fazer na ilha, incluindo, ciclismo, canoagem, pesca, passeios de Segway, aluguel de carrinho de NEV / golfe, Eco Tours, Putt Putt Golf, e muito muito mais. Por favor, sinta-se livre para enviar-nos para mais informações e datas em eventos locais e acontecimentos em torno da ilha. 7 night minimum stay is preferred less then 7 nights are based on owner's discretion and openings in the calendar. Damage Protection is not required but strongly recommended over a refundable damage deposit. Refundable damage deposit is typically 350.00 or per the discretion of the owner depending on amount of guests staying. Pet refundable damage deposit is required.Rates are subject to change until reservation is confirmed. All reservations are final and no cancellations or refunds allowed, we highly recommend you book your travel insurance for these type of potential emergencies. If at anytime owner feels need to enter the property due to the safety of the guests or neighbors the owner will contact guest prior unless it is in the event of an emergency. 2 cars ONLY allowed , any guests visiting the renting guest may park elsewhere along the streets. NO PETS unless owner approves, no exceptions. No late check outs or early check in's without owners approval. If there is an opening at the end of a reservation then a late check out may be granted per owners approval only, anything after noon will be charged a 50.00 fee to be paid with CC or cash only. The island has a very strict 10:00 pm noise ordinance to ensure the peace and enjoyment of all residents and guests enjoying the island please adhere to the noise ordinance and respect the neighbors.